We went to Toronto with plans to spend a lot of time at the amusement park Canada's Wonderland, which ranks third in the world for number of roller coasters. We all love the coasters, so that was a big draw for us! Nathan was a bit nervous on his first couple of rides, since he wasn't old enough for the big rides when we went to Disney 5 years ago, but once he tried a couple he was the most fearless of us all. He went with his hands up on all of the roller coasters after that, which is something I can't do at all. I love the rides, but I always hold on! 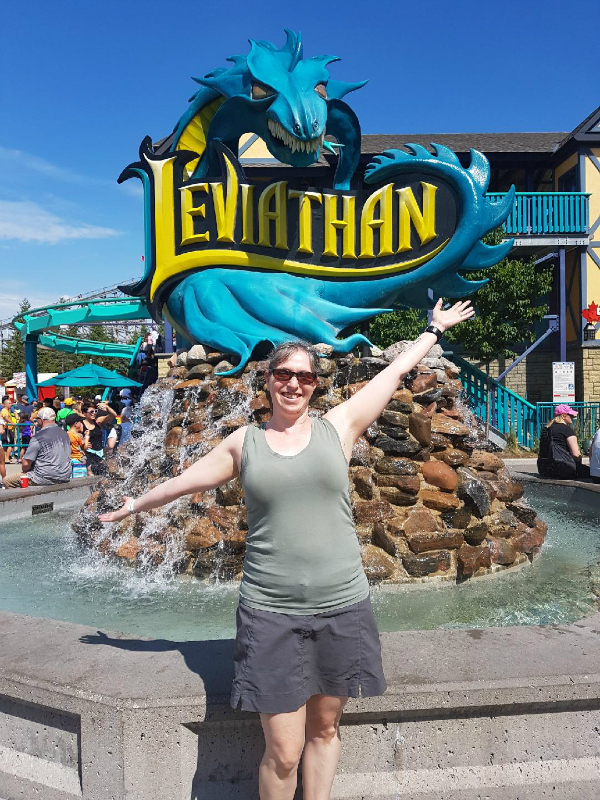 Leviathan is the biggest coaster there (and the biggest in Canada) and it was my favourite, though I admit to being nervous the first time we rode it. It does go 148 km/hr (92 mph) and the first drop is from 306 ft high after all! Of course, my love for it was only increased by the fabulous dragon at the entrance to the ride. I was amazed by the variation in women's clothing at the park, where it was more pronounced than even on the city streets. We saw everything from Islamic dress where only the women's eyes were visible (I don't know the proper name for it) to bikinis (there's a water slide section in the park, but women in bikinis were walking around other parts of the park as well) to women in long dresses with prayer coverings on their hair to women in shorts so short their bum cheeks were clearly visible. It was definitely different from living in a small town where the women all dress more or less alike. Our last day in the park, which was also my birthday, there was thunder and lightning and crazy heavy rain around supper time. We hung around, since the forecast said it would clear away and it did. Even better, most people had left so we practically had the park to ourselves for the last few hours. It was great! There were no lines so we were able to have a last ride or two on all of our favourite rides before we had to leave. 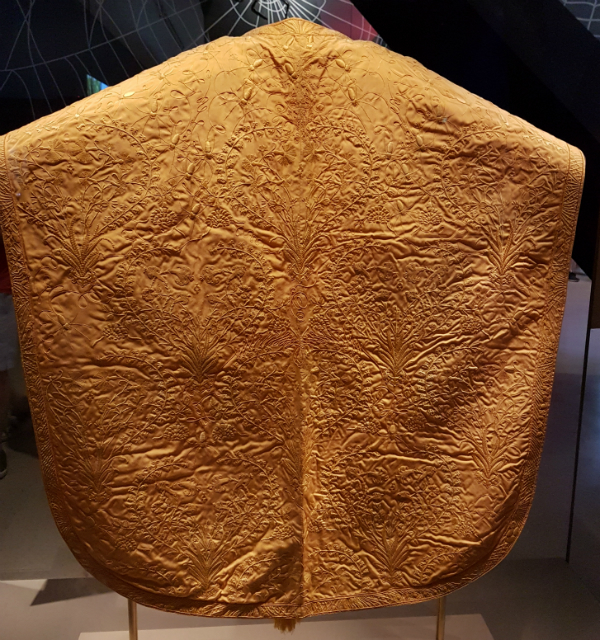 We visited the Royal Ontario Museum, which had a fascinating spider exhibit. 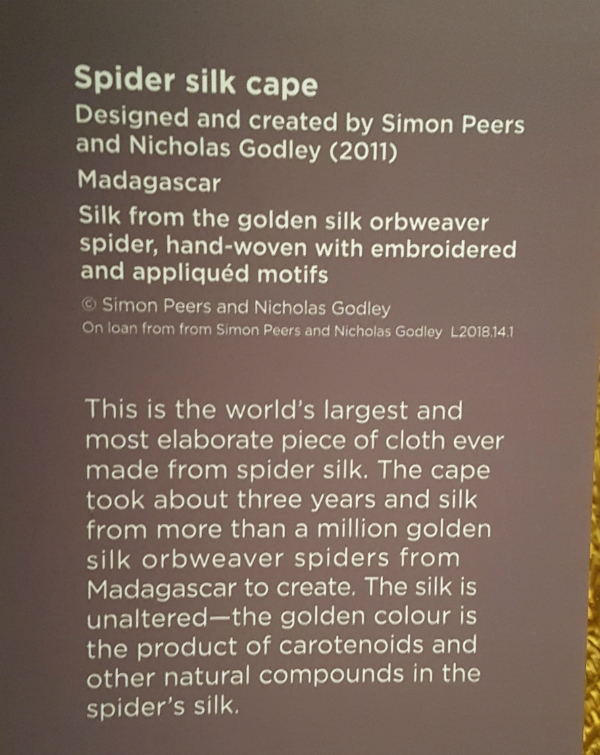 I didn't take pictures of the black widow or the tarantulas (you're welcome, lol), but I had to take pictures of this gorgeous cape made from spider silk. Who ever thought such a thing was even possible?! 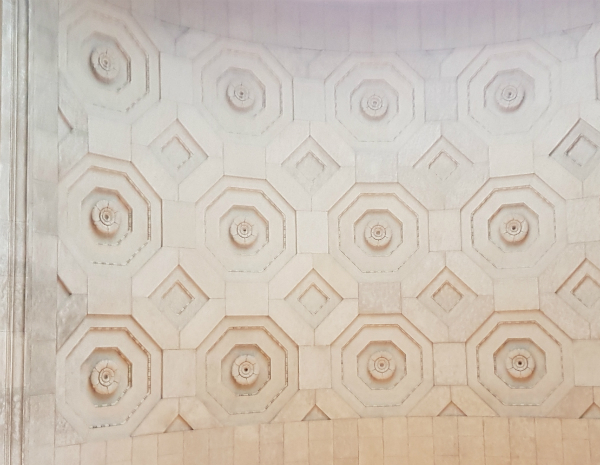 Toronto's Union Station has this beautiful roof in one of its halls. Unfortunately, my picture is a bit blurry, but wouldn't it be a fun EPP design? 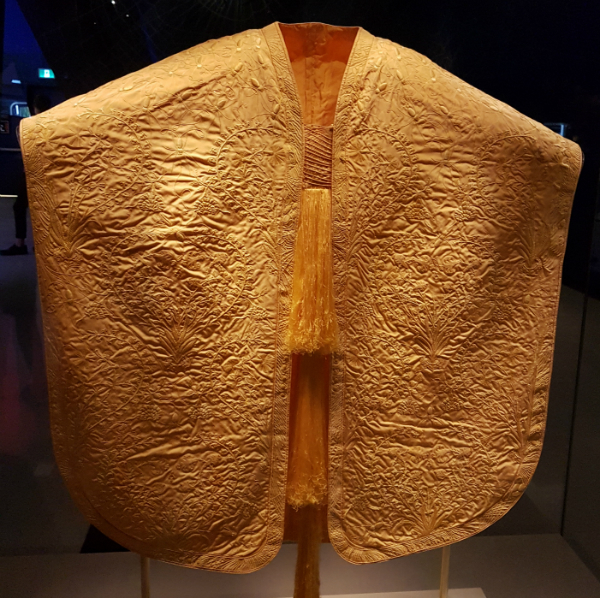 I got to meet up with Elisa (@elisasgallery on IG) for an afternoon to visit the Canadian Textile Museum, which had a quilt exhibit, but for some reason we didn't take any pictures. It was my first time actually getting to meet an online quilting friend and afterwards Paul asked me if it was awkward, but it wasn't at all. It was lovely and I'm so glad Elisa suggested it. We visited the CN Tower and an aquarium where we could touch the stingrays (so cool!) and we went to a Blue Jays baseball game. One ball was hit right towards where Nathan and I were standing in the shade, caught by a fan only a few seats away from us. It's quite something to experience the power of a ball hit by a major league batter coming almost straight at you! 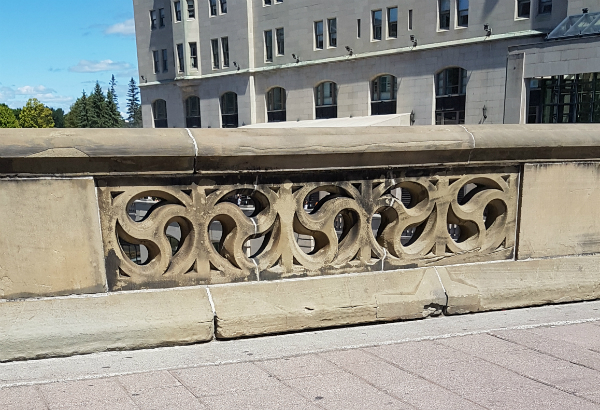 After we were finished in Toronto, we went to Ottawa. The Canadian Museum of Nature had a brain exhibit, which included a section on the five senses. 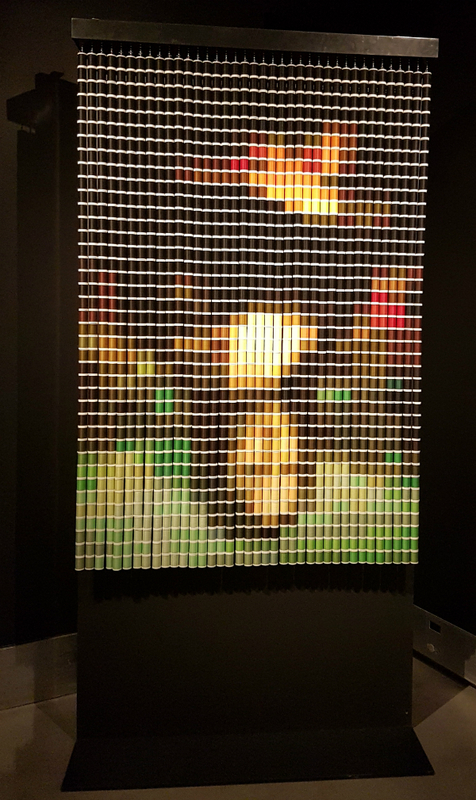 Amid the information on vision was this Mona Lisa made of spools of thread. Yes, it was upside down, but when viewed through lenses it appeared properly right side up and smaller, allowing the image to be more easily recognized. It's rather like a pixelated quilt, don't you think? 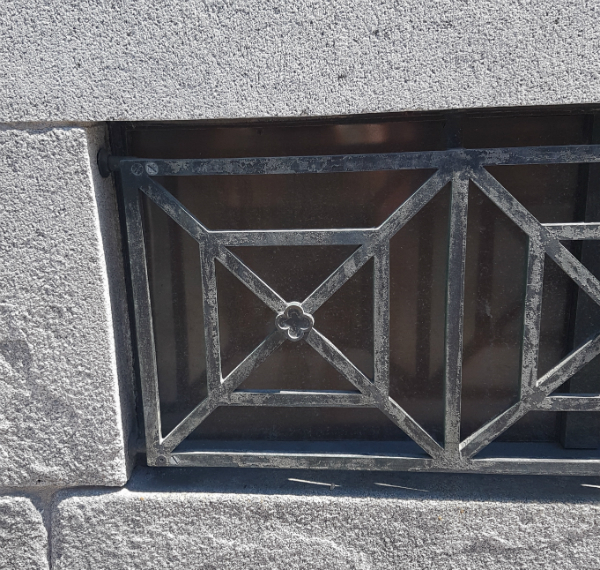 and this grate in a wall. Design ideas are everywhere and there's no chance I'll ever have time to make everything that is clamoring for my attention. No chance I'll ever be bored, either! While in Ottawa we toured the Parliament buildings (you have to line up around 8 am to get tickets! ), the Supreme Court building, the Royal Canadian Mint and the Canadian War Museum. They were all so interesting, but by the end we were finding it hard to take in more information. I didn't even visit all of the War Museum because it was so big and there was so much to see. It would be worth another visit if I'm ever in Ottawa again. And if you're in Ottawa, I recommend all of the things we visited, just maybe not all in a 3 day span. We also went to a football game. Now, football is not my thing at all and I usually watch only one game a year, which is the Super Bowl. Aiden is a big football fan, though, so this was the highlight of the trip for him, even though his team lost. Of course, he wasn't cheering for the home team, so he took a bit of good natured ribbing from the people sitting around us, who made a point of high fiving him when Ottawa scored a touchdown, lol. 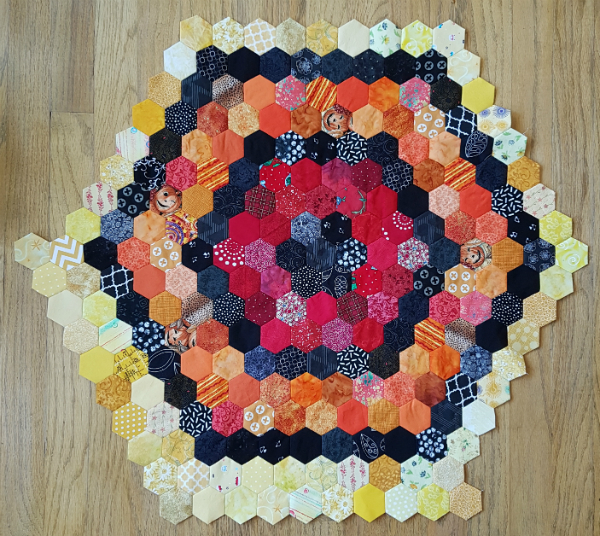 In between all of the roller coasters, museums and sporting events, I did a fair bit of work on my hexie rainbow quilt. 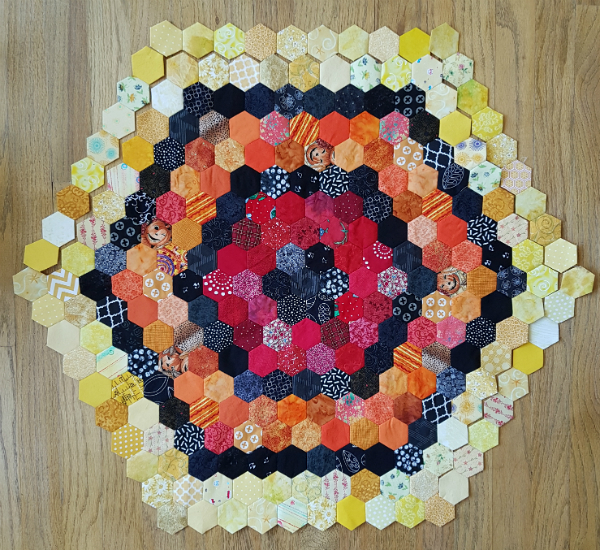 Before we left I asked a friend if she had any yellow scraps she'd be willing to share because I was about 20 hexies short of the 102 I needed. 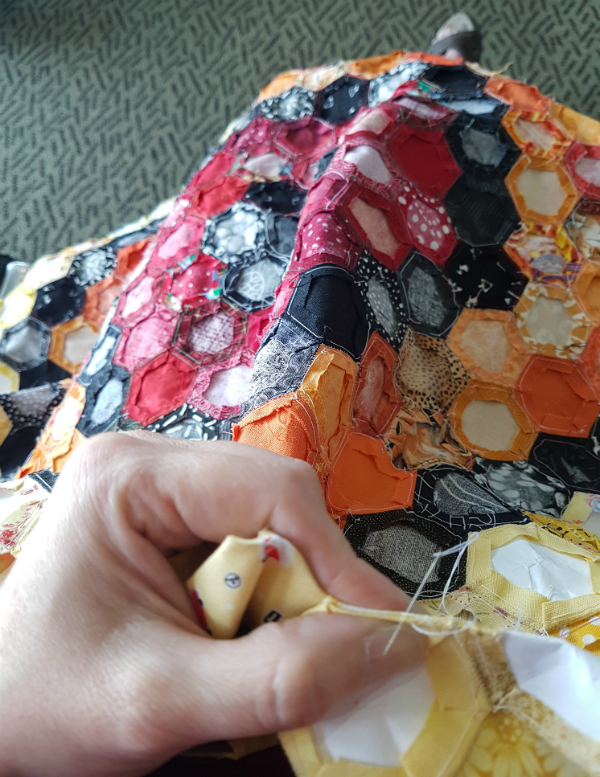 She generously gave me more than enough, so when we left home I had some yellow hexies left to baste and then I could start joining them together to make the two yellow rounds. And here's where the rainbow stands now. 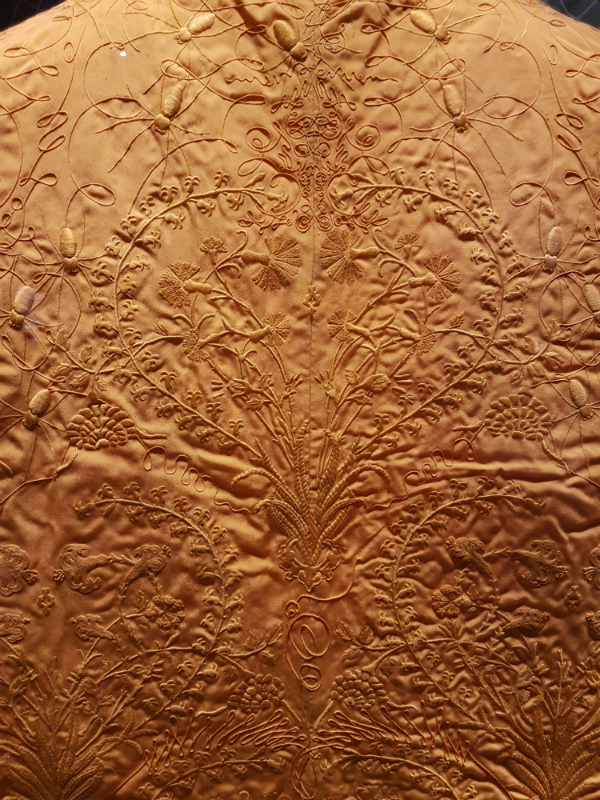 It measures approximately 31" wide and 27" high. 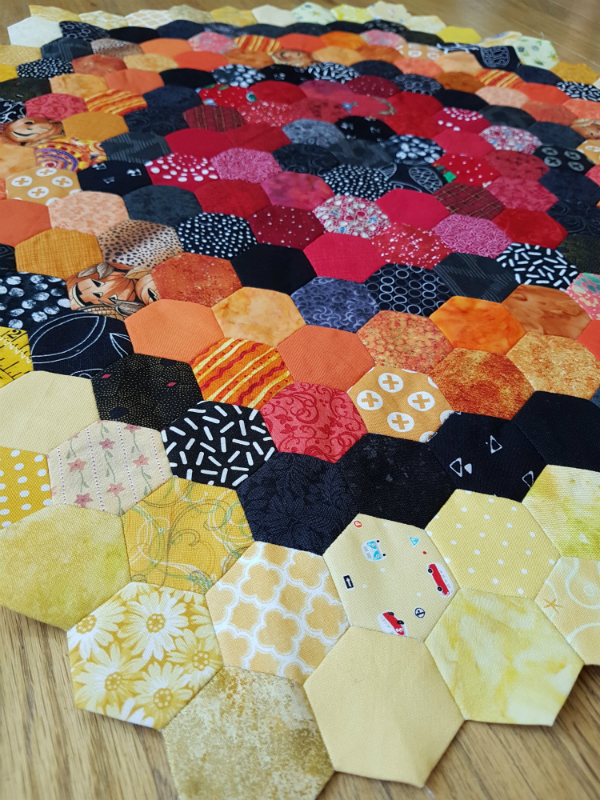 The rest of the yellow hexies are joined into rows and here's what it will look like when they're all sewn on. It's getting so big that it covers my legs while I sew! This was at the airport yesterday, waiting to fly home. It was great to get away and have a family adventure, especially since the boys are now 16, 14 and 10 and our years of travelling all together are winding down. It was nice to come back home too. I started sewing not long after I woke up this morning and Aiden was playing guitar a good portion of the day. Just before we left home, I had an email from Island Batik with the tracking information for my second box of goodies, so I know that it's waiting for me at the post office. You can be sure I will be checking the mail bright and early tomorrow morning 😊 I'll share everything in it on IG tomorrow and I'll have pictures here later in the week. I'll be back to my regular Monday devotions next week with one prompted by all of the roller coasters we rode. In the meantime, I hope you're finding time for adventures too! It sounds like a really lovely vacation, Leanne, and happy belated birthday! Roller coasters are so much fun, and getting the park almost to yourself sounds like a great birthday treat. Welcome home. It looks and sounds like you have a great vacation. Happy Birthday!! That Mona Lisa is amazing! Sounds like you had a wonderful time, and I hope you had a great birthday Leanne!